It has been a while I was away from this forum and comes back with a small though useful information about Right to return Feature of Position Management. 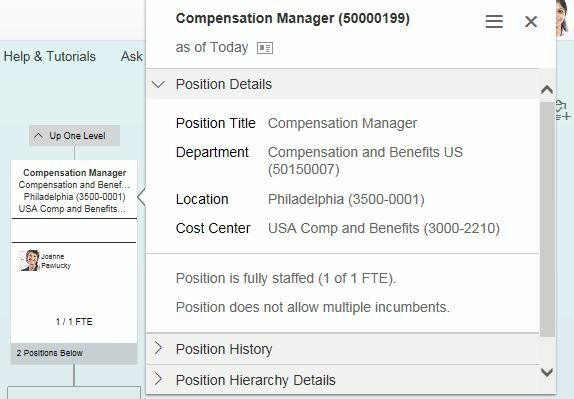 What I am trying to achieve here is to consolidate everthing related to Right to Return feature of one of the important functionalities of SuccessFactors Employee central, Positon Management and its related release upgrade in b1802. As of b1802 release, SAP SuccessFactors have released a new data model for Right to Return feature. The new data model is necessary to use certain new general data protection and privacy features settings (e.g Data Blocking). We can continue using the old data model but wont be able to make full use of GDPR features. SAP SuccessFactors though strongly suggest moving onto the new data model. After migration to the new data model, the storage and retrieval of data for Right to Return info will be faster and more efficient. All the business requirements for Right to Return will still be met as before. From a purely technical point of view, this migration is optional. However, please note that any upcoming developments for Position Management will be based on the new data model only. In addition, if you don’t complete the migration, you won’t meet certain legal requirements for data protection and privacy. This is an Admin opt-in feature for customers who are already actively using the Right to Return feature. You can migrate to the new model in the Upgrade Center. For new customers who have Right to Return enabled but no Right to Return data is created in your instance or customers who are configuring Right to Return after the b1802 release, you instance will have the new data model for Right to Return already deployed (the item will not be available in the Upgrade Center). Once you migrate to the new data model for Right to Return, it’s important that you not longer set the Visibility field for Right to Return. Please be aware that the new data model currently does not support business rules. If you have any business rules configure and triggered on the Position Object Definition, which check the position Right to Return, these will no longer work after the migration. This change affect ALL users.Estimated time for the upgrade to complete is about 10 minutes but it may varies. The migration is an Opt-In feature. once the migration is completed, customers can ONLY user the new data model. After the migration, customers should not change the visibility of the Right to Return in the object definition for the position anymore. It may lead to inconsistencies if done so. Also the new data model currently does not support business rules. If customers have any business rules configure and triggered on the Position Object Definition, which check the position Right to Return, these will no longer work after the migration. All upcoming developmets related to Right to return or GDPR will be based on the new data model only. So it becomes more so important to migrate on it. 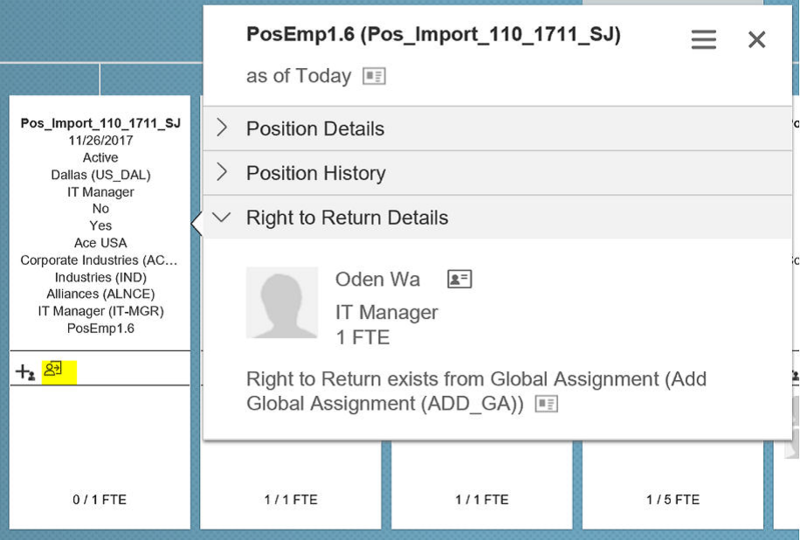 The right to return is displayed, as of date on the Position Tile and on the side panel of the position Org Chart. After the migration, this information wont be displayed in the position quick card or the Position under mange data. However, it will be displayed under manage data when ‘Position Right to return’ is selected. The configuration options under Position Management settings for Right to Returns remains as it was earlier. No Change!!! The Permmissions do see a change for the new right to return model. For the current(composite data model), customers can use the field-level permissions. For the new(MDF) based data model, permissions needs to be set up as described in the MDF Implementation guides. After the migration, all relevant users will have the required permissions for Right to returns based on the New data model. Mgrating to new data model will affect the position API customers uses for custom integration and replication. If customers uses such an API and want to migrate, they need to create a BCP ticket under component LOD-SF-INT-EC. In the title of the ticket, please include the text “Right to return migration – Integration Issue” so that it can be assigned quickly to the relevant support team. Excellent Blog, Jitendra. This is a major change from custom Integrations perspective. Can we make it inactive if our clients don’t use Right to Return feature? This is an Admin opt-in feature for customers who are already actively using the Right to Return feature. The customer who are not using it will be migrated to it automatically so as if they decide to us it in future, they are on latest version of it. Jitendra – Very Informative. Thank You.